The moment we all have been waiting for is here. Season 12 of Grey’s Anatomy will premiere on Thursday, September 24 at 8 p.m. I don’t know about you, but I am very anxious to see how this season will pan out without McDreamy. Shonda Rhimes, the show’s wonderful creator, will surprise us all with the first episode. My predictions for the season are this: I think Meredith is going to fall for this new intern or vice versa, just like McDreamy fell in love with her. Resident and intern love…I mean it’s happened more than once right?! Make sure you keep your eyes open for flirtatious commentary or moves between Dr. Deluca and any of the residents! One of my favorites, Christina Yang might be loving her new job as Chief of Cardio over in Switzerland, but there is talk that she’ll make a few appearances in the new season. I just hope her appearances last more than one episode! Another couple we have learned to love throughout past seasons, Arizona and Callie, are no longer together…BUT don’t freight they are supposedly both getting new love interests! As for Avery and Kepner, after unfortunately losing their first child, and Kepner thinking about returning to Iraq, I really hope they decide to stay together and try for another baby. 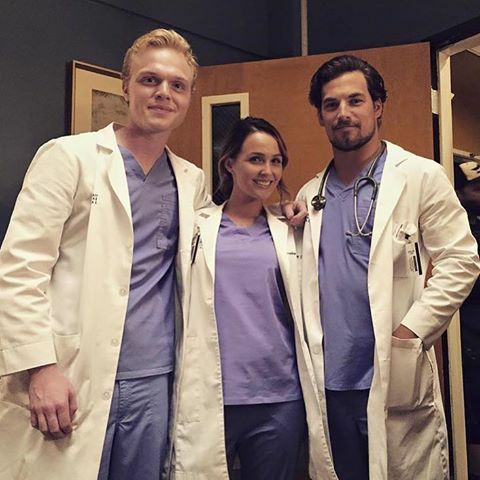 We can’t forget about some of the original cast members like Dr. Bailey, Dr. Karev, and Dr. Weber! Bailey is still fighting to become Chief of Surgery, and this isn’t her first rodeo fighting for it. I think that Bailey will finally have her dream come true and become the Chief. Karev, we know, is the Head of the Pediatric unit and still with Jo, and I absolutely adore their relationship. I hear wedding bells in the distance, don’t you? As for Dr. Weber, his love is still strong for Avery’s mother and it looks like they will continue with their wedding plans after multiple hiccups in the road! Based off of the last episode of season 11, Meredith Grey will be coming back to Grey Sloan Hospital with her now three children in the premiere episode. I mean Alex did come to her when she had the baby because he is her “person.” He must have convinced her to come back to work right?? Remember Maggie? Yeah, Meredith’s other half-sister, and daughter of Dr. Weber, she is still there at Grey Sloan, along with the late Derek Shepard’s sister, Amelia. These two will be standing by Meredith’s side because she’s raising three children by herself, and they are the only family Meredith and the kids have. There was also talk between Meredith and Alex at the hospital after giving birth that she didn’t want to go back to the house Derek and herself built together. In fact, she wanted to sell it and buy back her mother’s house. I predict that in the first episode Meredith will be moving out and into her old house and finding a few roommates; maybe Maggie and Amelia. Speaking of Amelia, she and Dr. Hunt are still one of the steamy couples at Grey Sloan. Hopefully Hunt’s dream of having a family will come true. As for the actual medical stuff that no one really pays attention to, maybe there will be a big accident, and we’ll be able to point out what interns will make it at Grey Sloan Hospital. We won’t find out until next Thursday!